Should You Really Not Smile Until Christmas? >> Should You Really Not Smile Until Christmas? The old teaching adage “Don’t Smile Until Christmas” has been praised and criticized, ignored and heeded, and generally very much discussed. That’s because while there is a good deal of wisdom behind this saying, it is somewhat misguided in its application. The beginning of the year is absolutely critical, and many of us know from experience that if you try to start off the year by having fun with the kids that you’re going to quickly find yourself in a pickle. But the answer isn’t to put away our smiles either. As you start off the year, the key is to have balance. 1. Do be strict but also be kind. I recently came across a discussion board that asked the question “Are you a strict teacher or a kind one?” My immediate response was “both.” The best teachers are very strict but not mean. They have high expectations and are firm in their discipline. But they are also kind and encouraging to their students. Discipline is most effective when delivered calmly. 2. Do address every issue, but be encouraging. You absolutely do need to address every single issue the first weeks of school. As I discuss in my post about classroom management concepts I wish I had understood as a first-year teacher, I didn’t address small issues as a rookie, and this resulted in a bit of disaster that culminated with me crying in a back hallway before school. Addressing even the small issues during the first days of school is absolutely one of the keys to success. But once again, this doesn’t mean you have to put the smile away. A student will respond much better to a kind reminder that “you cannot run into class, Alexis. Please go back out and come in again” said with a smile than they will to the same statement said with a glare and a growl. 3. Do be professional, but be personable. As I discuss in my post about being professional without being distant, you absolutely need to show your students that you care about them. But you need to be professional in your interactions as well. The way to do this is to be their mentor, not their friend. To be friendly, but not familiar. The smile should be present, but in the proper context. 4. Do be serious about learning, but also show that it’s fun. Your students need to see from day one that you are serious about getting down to work. Show them you value learning by getting right into your subject on day one and assigning homework within the first few days. But that doesn’t mean that learning has to be boring. Make your lessons fun and enjoyable and show them how much you love your subject. 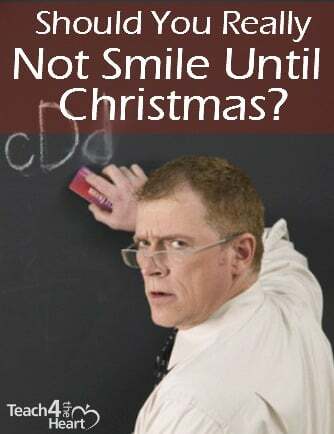 So should you smile before Christmas? Absolutely. But remember the spirit of this proverb and make establishing your classroom control your first priority. Once your class is well-managed and running smoothly, you will be able to have a lot more fun while remaining effective. So what do you think? Do you smile before Christmas? Share your thoughts by leaving a comment. Always. this helps people to gain a certain level of comfort with you. Its like the front door. But not just with your mouth, with your eyes. Yes, I smile to help my students feel comfortable!